Scanner Master Police Scanners Corporation was formed in 1978 and since that time has been producing the nation's most comprehensive communications guidebooks including Scanner Master regional volumes and Monitor America. Richard Barnett of Scanner Master Police Scanners also edited Police Call, the 7-volume regional frequency guide series that went out of production in 2005.For the past 15 years, Scanner Master Police Scanners has been a consultant to the scanner-radio industry. We participated in the design and development of the industry's first trunktracking scanner, the Bearcat 235, as well as many later models. Scanner Master Police Scanners is also the North American distributor for Butel's ARC (Advanced Radio Control) scanner software, the finest and most popular scanner software sold worldwide today. Scanner Master Police Scanners is also the North American distributor for a line of Czech-built scanner accessories including filters and pre-amplifiers. Scanner Master Police Scanners can also work with you to develop customized monitoring systems. Applications include dispatch centers, news gathering organizations and remote monitoring stations. We have recently worked with the Miami Herald and Metro Traffic Control on such custom installation and programming. Scanner Master Police Scanners and its affiliated companies are currently developing sophisticated monitoring solutions and accessories, both software and hardware-based. Check our News, our New Product's sections. 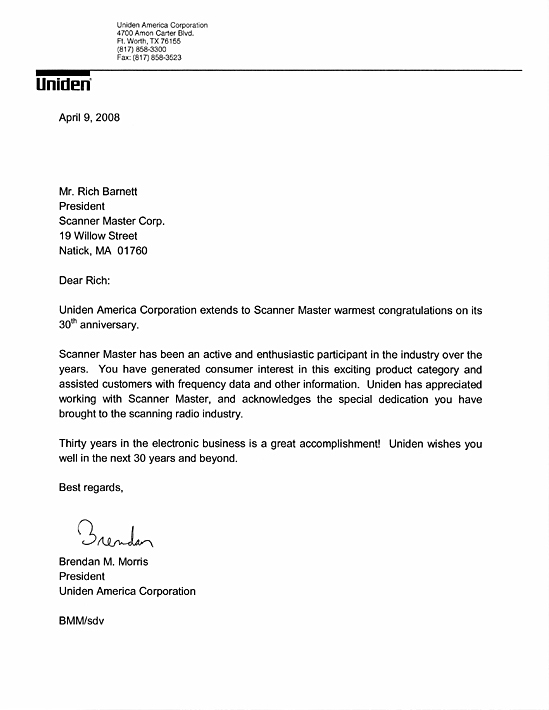 Scanner Master Police Scanners Corporation recently celebrated it's 30 year anniversary. 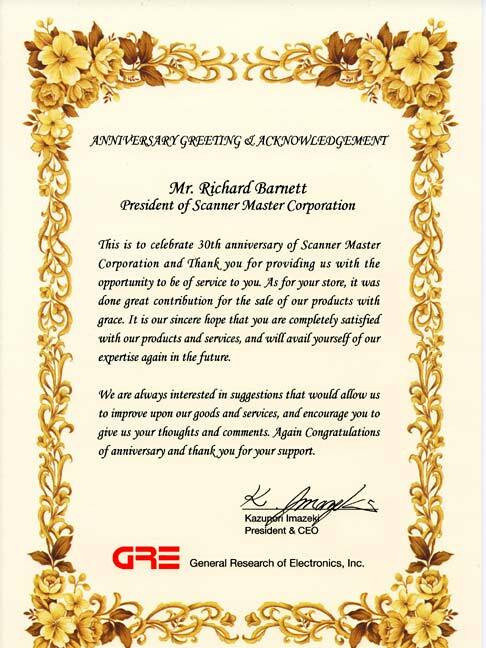 The scanner manufacturers offer congratulations on Scanner Master's 30th anniversary. 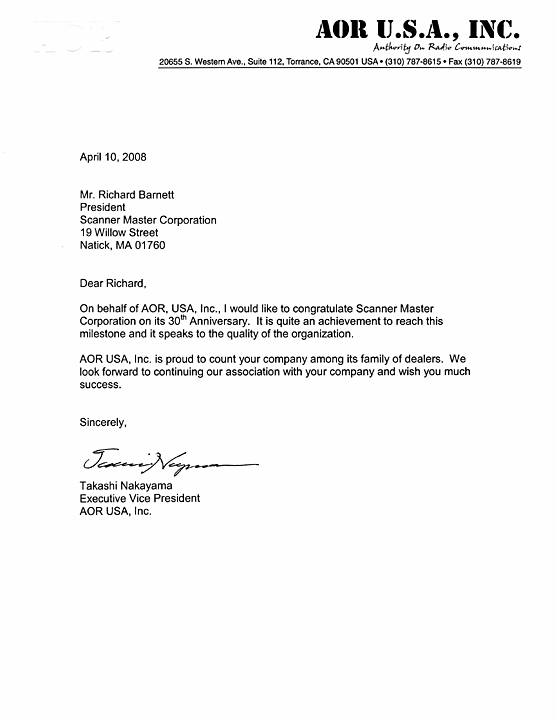 AOR letter. Uniden letter. GRE letter. We also urge you to subscribe to our e-mail newsletter which will notify you automatically of important new product news. Read what some of our customers have to say about us on our Customer Comments page. Customer service and satisfaction is one of our main priorities, Meet Our Staff and see some of the people that work at Scanner Master Police Scanners.